I have a litany of amazing videos and movies that I wish more people could see, some very rare, such as the video Growing Gold: The Quest For Emergent Matter by John V. Milewski, PhD. In the video, Dr. Milewski proves without a shadow of a doubt that monatomic ORMUS elements exist in common bottle glass, by extracting gold and platinum from the glass with a $40 microwave oven and a few simple accessories. So what? What the heck does that mean? Well, if you've read this blog or heard me speak anywhere, then you've likely heard me talk about ORMUS, aka monatomic elements, aka m-state elements, etc. Monatomic elements are a small select group of metals on the periodic chart that can exist as ceramic powders in which the metal is composed of individual discrete atoms not connected to each other (monatomic), as opposed to the usual form, which is a collection of metal atoms connected to each other in a 3D crystalline grid pattern (polyatomic). They are extremely rejuvenative to living organisms, and they expand or enhance consciousness and awareness. There are many other applications for these elements, including creating nontoxic energy, space travel, and more. The ORMUS elements known publicly so far are: cobalt, nickel, copper, ruthenium, rhodium, palladium, silver, osmium, iridium, platinum, gold, mercury. In their monatomic state, these metals become room temperature superconducting ceramics, that is, they conduct electricity with no resistance. Being a superconductor, they exhibit many "supernatural" properties, such as existing simultaneously in two or more places at once, or under certain circumstances, disappearing from our 3D physical reality into other "dimensions" of reality, then reappearing. "The discovery of ORMUS elements is today's equivalent of the discovery of E=MC"
Experiments are showing that these elements exist simultaneously in multiple dimensions, and have many applications in health, space travel, free energy production, water purification, and much more. ORMUS elements are in the human body, brain, and nervous system, they are where the mind-body connection occurs. The discovery of ORMUS elements is today's equivalent of the discovery of E=MC, it is that significant, and will be recognized so as more applications evolve. ORMUS is one of the American government's biggest secrets, research into them often becomes classified. 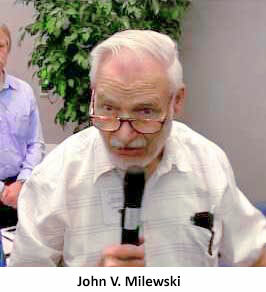 I was very blessed to interview Dr. John Milewski, a materials scientist and ORMUS expert in January 2011. You can listen to this fascinating discussion below. Dr. Milewski has three DVDs in the Growing Gold series plus a special report on assaying black sand magnetite in a microwave to get rhodium and iridium available for purchase. The report comes with a 23-page list of equipment and supplies you need for the process. Each item costs $25, or you may buy all four for $100. You may purchase by sending a request and payment by PayPal to the email address below, or by check to the postal address.